Even a tale as old as time is new to the youngest among us, and that's so true of Beauty and the Beast (and all other Disney animated movies). Parents know these stories, love them, and they've even been around long enough to have grown up with them, and now our kids get to enjoy them too. 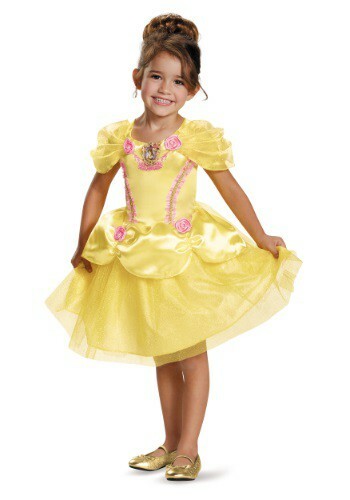 If your little one absolutely loves Beauty and the Beast, there is no better costume than this Belle Toddler Costume! It's her lovely dress from the classic ballroom scene. It's a tale as old as time, and she will love being a part of it in this licensed Disney costume as she pretends to twirl around a magical ballroom. This gown has everything a little princess could hope for, besides a giant library. The top is made of a soft, satiny material with pink ruffles and gold detailing. There's a gold cameo at the neckline with floral sparkles and pink roses on the sides. There are sheer off the shoulder sleeves with sparkles in the fabric. The skirt is nice and fluffy with a satin material with ruching and pink roses. There are layers of light fabric under the shiny surface for fun twirl factor for the perfect dancing experience. Beauty and the Beast might be a tale as old as time for you but for your little girl it's a brand new story and it's sure to have a happy ending!